CAPTEST 2019 is the Communication Aptitude Test, that is designed to evaluate students based on interest, aptitude, and potential for adapting to a professional communication course. The Amrita University of Mass Communication conducts it annually. This exam offers admission into the 3 year B.A Mass Communication Programme, 2 year M.A Communication Programme and Post Graduate Diploma in Journalism. Candidates can get admission into undergraduate and postgraduate courses at Amrita University. The entrance test will be held at Ettimadai campus of Amrita University. The admission procedure is expected to commence from November. In this section, you will find all the information related to Amrita University of Mass Communication Entrance exam. Following are the details for undergraduate courses. The information given below is tentative. Candidates should fill the application form before the last date of the application ends. Candidates are advised to register. The courses offered by the university are B.A Mass Communication, M.A in Communication, P.G Diploma in Journalism, and PhD in Communication. Applying candidates should meet the following criteria to apply for the examination conducted by Amrita University. The following criteria are according to the information that released officially by the University. Should obtain a certificate from Association of Indian Universities, New Delhi by the candidates who completed their education from foreign Universities. Candidates who are having 70% aggregate marks during the first two years of their degree will be exempted from Communication Aptitude Test. Exam Pattern of CAPTEST will differ according to the circumspection of the examiners. The CAPTEST sections differ according to the Examiners. The topics covered are Indian current affairs, Logical Reasoning, and English Grammar. The application form will be available for both Undergraduate and Postgraduate courses will be available. 10th and 12th mark sheets and all semesters mark sheets of the bachelor’s programme if applying for M.A courses. Rs.500 – Application fee that has to be paid by the aspirants for CAPTEST 2019. Candidates should make a DD in favour of Amrita University and should send it along with application form. Without DD application form will be rejected. Should carry the mark sheet to the examination hall if not the candidate is not allowed. Admit card will be issued generally before two weeks or 15days before the commencement of exam. It can be downloaded through online mode from the official website of Amrita University. Admit card contains the basic details of the applying candidate such as candidate name, Registration number, address, seat number, center etc. Hall ticket will not be sent by post. In order to download the admit card, the candidate needs to fill in the details that are mentioned at the time of applying for the examination. It is mandatory for students to bring in the admit card to write the test, in failing to do so the candidate will not be allowed to write the examination. The candidates are required to show the admit card to the invigilator whenever he asks for it. Results of CAPTEST 2019 will be declared in May 2019 tentatively. Exam participants can check their results by logging in the official website of Amrita Vishwavidhyapeetham. Candidates have to enter their details mentioned on the admit card to view the results. Only the qualified students are eligible to appear for counselling. 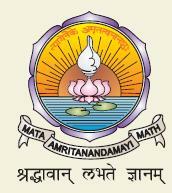 Amrita results indicate score obtained and merit position. Counselling will begin in few days after the declaration of result. All the eligible candidates will be invited for counselling. Admissions will be strictly based on the marks obtained by the candidates. Qualified candidates should bring all the original documents with them. You will be called to counselling on the basis of merit list.